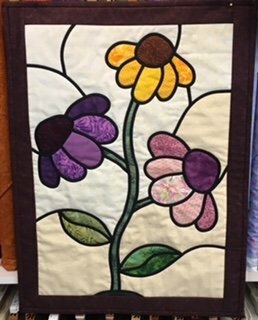 Transform your favorite fabrics into a quilt that looks like a stained glass window. You will learn a quicker cut-and-fuse technique with contrasting bias leading fused and stitched with a double needle. It's easier than it looks and you learn the tricks of the trade so you can design your own. Choose from Clematis or Cone Flower.